Are you needing to move a thick fluid, move liquid farther or higher? Do you have a below grade sump or pit you’re looking to empty? 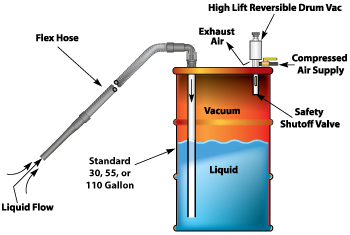 Then EXAIR has the solution for you, enter the High Lift Reversible Drum Vac. Like the standard Reversible Drum Vac, the High Lift RDV is a compressed air operated, liquid only vacuum with no moving parts or motors that can fail, like those in traditional electrically powered vacuums. What separates the High Lift RDV from the traditional version is the higher vacuum it achieves which allows you to lift liquids up to 15′, move liquids up to 20′ and handle fluids with viscosity as high as 1400 centipoise. The High Lift Reversible Drum Vac is a high powered vacuum able to lift liquids up to 15′ and fill a 55 gallon drum in less than 85 seconds! The High Lift Reversible Drum Vac features a two-way pump constructed of stainless steel and a built-in safety relieve valve to avoid over pressurizing or over-filling the drum. Air consumption is minimal, at 43 SCFM @ 80 PSIG, while maintaining a low noise level of only 83 dBA. In “empty” mode, the HLRDV achieves a flow rate of 30 gallons per minute (water) to quickly empty the drum. The Standard Systems include the High Lift Reversible Drum Vac, shutoff valve, 20′ vacuum hose, standpipe, 90° quick release elbow and aluminum chip wand. Deluxe Systems include all of the items shown above in the “Standard” System and adds a drum dolly, ABS plastic spill recovery kit, (2) extension wands, crevice tool, skimmer tool and a magnetic tool holder. And Premium Systems include all of the items in “Deluxe” Systems and adds the drum with lock ring and lid, heavy duty aluminum tools and 20′ compressed air hose. If you have any questions about the High Lift Reversible Drum Vac system or any of our products, please contact an application engineer for assistance. As EXAIR Atomizing Nozzles become more popular with our customers, we are getting a lot of interesting questions that folks have regarding the nozzles themselves and the information that we provide so the customer can make an informed decision. The answer is that you will not know until you actually perform a test with your specific material. However, if you apply some simple logic to the question, a higher viscosity fluid is going to flow less than water through an Atomizing Nozzle. So, to compensate, you can select an Atomizing Nozzle size which has a higher water flow rate in order to compensate for a thicker fluid. A chart for viscosity of common fluids can be accessed here. 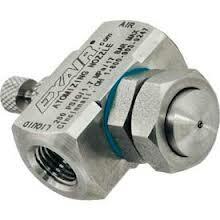 You do have options in terms of which style of Atomizing Nozzle you choose for the application. For example, fluids that have viscosity up to 200 centipoise can work well with either a siphon type or an internal mix type Atomizing Nozzle (an internal mix type can work with viscosity up to 300 centipoise). The siphon nozzle option is for applications where the fluid is not pressurized but is available from a nearby container (this can also be set up to be gravity fed type depending on the height of the fluid in relation to the nozzle). 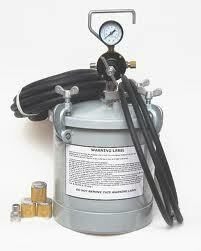 The internal mix nozzle is used when the applied liquid can be pressurized by a pump or perhaps by a pressure pot. For applications where the fluid is over 300 centipoise, an external mix Atomizing Nozzle is the suggested product to use. Because the air and the pressurized fluid mix out in front of the nozzle, the liquid is not subject to the back pressure present upon it in an internal mix nozzle configuration. Therefore, the liquid pressure and air pressure are completely independent. This means a much higher pressure can be used on the high viscosity fluid to push it through the nozzle and be atomized. The variety of nozzles available with different configurations, flow rates, spray patterns and abilities can be a little difficult to navigate without some help. That is expressly why we are here. To help customers determine what they need in this range of product. If you have been considering an Atomizing Nozzle for an application, please let us know if you have any questions or just want to talk things over to make sure you are headed in the right direction. We are here to help make the decision an easy one.